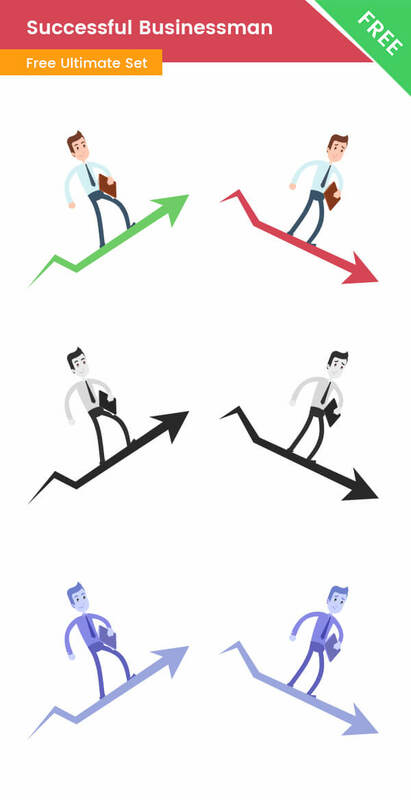 A successful businessman vector illustration that is showing a businessman on a graph. We’ve made him in a few different styles. There are 2 illustrations – one with positive, growing business, and one with bad results. These 2 vector illustrations are made in 3 different color schemes for your convenience. You will find a colored version, a black and white version of the illustration and one with a modern bluish colors. No matter what your designs scheme is, we are sure that one of these color versions will fit your design perfectly. Anyway, if you want a different color version you can use the included vector file and modify this successful and failure graphics and make them with different colors.